While in school, were you ever challenged by a language arts teacher to create a poem that fashioned the outline of a shape? 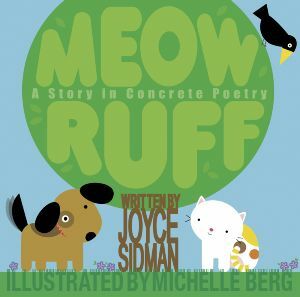 Joyce Sidman and Michelle Berg have taken the concept of concrete poetry, also known as visual or shape poetry, and made a spectacular-in-the-vernacular, full-length picture book that’s not only literary eye candy, but has subtle earth-friendly messages throughout. But my words cannot do justice to Meow Ruff. To really appreciate the “plump bright dome of sugary white white-muffin” clouds, you’ll just have to pick up a copy for yourself. And to further sweeten the deal, know that Sidman is an ASPCA Henry Bergh award recipient and Ms. Berg is a guardian to a loveable mutt. Kids can have a try at nature-inspired concrete poetry on this fun site sponsored by the UK-based Woodland Trust.